Adding a single-storey extension and applying thermal upgrades to a 1945 council-built semi. A total 12 homes. 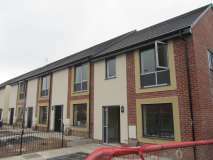 One terrace of 8 terraced houses (terrace A).One terrace of 4 houses (terrace C). Planned occupancy : Family life. 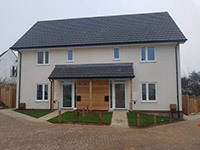 A terrace of four affordable homes built to the AECB Silver Standard within the village of Chrishall in Hertfordshire. 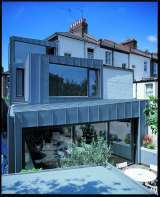 This 4-storey semi-detached Grade II listed Victorian townhouse has been eco-retrofitted to a high standard of airtightness and thermal performance. The 170-year old, solid brick building has been internally retrofitted with over 9 types of insulation material, each a bespoke solution to localised performance requirements respecting the historic significance of the existing fabric. 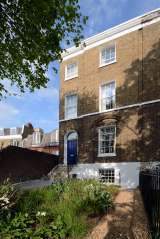 The existing sash windows and doors have been upgraded through the installation of double-glazed secondary glazing. 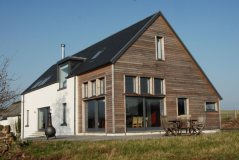 High performance insulation materials together with careful airtightness and thermal bridge detailing have resulted in a historic building that is both highly energy efficient and more comfortable to live in. Planned occupancy : Two people with occasional guests. Both occupants have their own home-office. The new-build sports changing pavilion for Dormers Wells High School was completed in 2015. 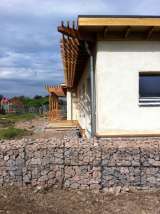 It is designed with the same palette of materials as the main school building, (which was completed in 2012 under the BSF programme with Paul Cayford as Client Adviser). Cavity masonry wall construction was selected for its robustness and buildability with an airtight plaster internal finish. 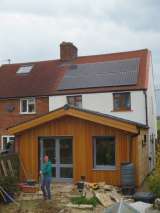 The roof structure is a continuous CLT deck exposed on the inside. Airtightness result of 0.3 1/h was achieved on the first test, with energy use of 34 kWh/sqm.year modelled with PHPP. Planned occupancy : Two separate changing areas are each able to accommodate two full classes, ie 120 student maximum capacity. A central kitchen allows for the dual use as a sports pavilion. This new house replaced a run-down Victorian farmhouse, and re-attaches to a 150 year old adjacent barn. The house has four bedrooms, three bathrooms and is occupied by two adults and two young children. The site is in an exposed rural location in the west of Scotland with no shelter to previaling winds. Whole house calculation method : SELF DEVELOPED SPREADSHEET. 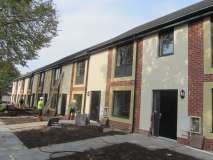 The new Eco-Hub is the centrepiece of the regeneration and transformation of the historic Lordship Recreation Ground, and has been designed to exemplary sustainable standards. Commissioned by Haringey Council and funded by the Heritage Lottery Fund Parks for People programme, Big Lottery and the Greater London Authority. It will provide teaching space for environmental education, a multi-purpose community space for community organisations including the Lordship Rec mother and toddler group, a public cafe near the playground and the lake, with kitchen and public WCs, and a boot room for Park volunteers. From the outset, detailed consultation with Friends of Lordship Rec, local user groups, environmental education teachers and officers at LB Haringey, helped develop a pragmatic building brief and set out the core aims of community involvement and a truly sustainable building design for the Eco-Hub. Local people joined the construction team to build the strawbale walls. Planned occupancy : Max. 50 people, 9 am to evening use.